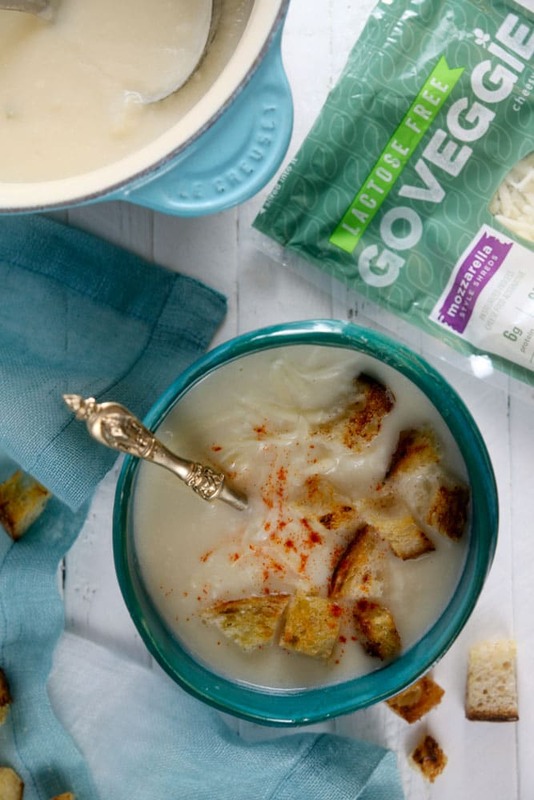 Creamy Cauliflower Cheese Soup with Smoked Paprika | Healthy. Delicious. This weekend, it felt like someone flipped a switch. We went from gorgeous late summer weather to what basically feels like winter. The heater kicked on, I pulled out my slippers, and I made a warm pot of creamy cauliflower cheese soup – it just seemed like the right thing to do. 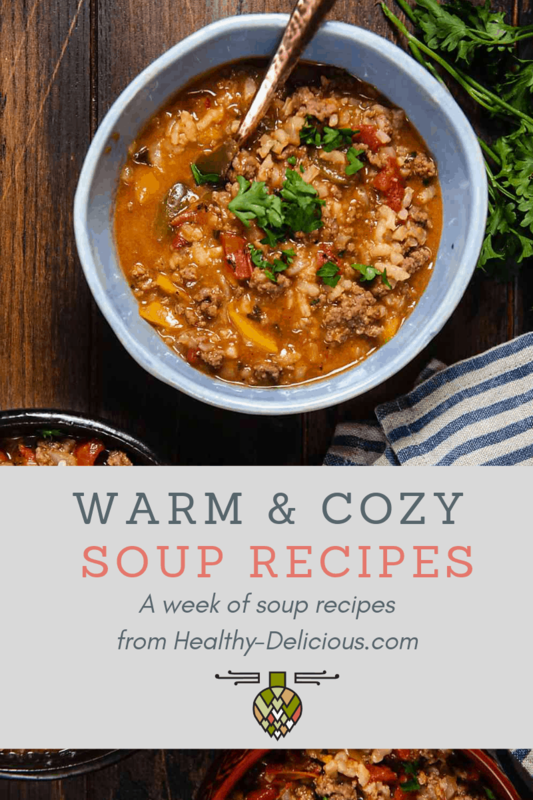 I love this soup because it’s so easy to make. 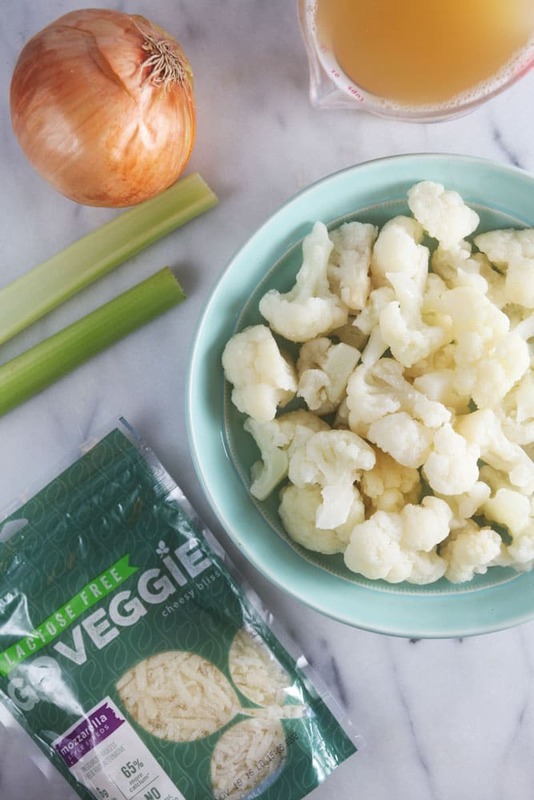 It only uses six ingredients – olive oil, celery, onion, frozen cauliflower, chicken stock, and GO VEGGIE lactose free mozzarella shreds. They’re ingredients I pretty much always have on hand, which means a warm, cozy pot of soup is never far away. GO VEGGIE‘s mozzarella shreds are one of my favorite products that they make. They melt really beautifully, especially in recipes like soup where there’s a lot of moisture, and they add tons of cheesy flavor without the fat. Plus they’re lactose free, which my stomach really appreciated after that baked rigatoni I made last week. 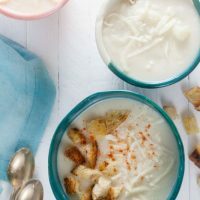 This cauliflower soup is so rich and flavorful that you’d never guess it’s so healthy – or so simple to make. 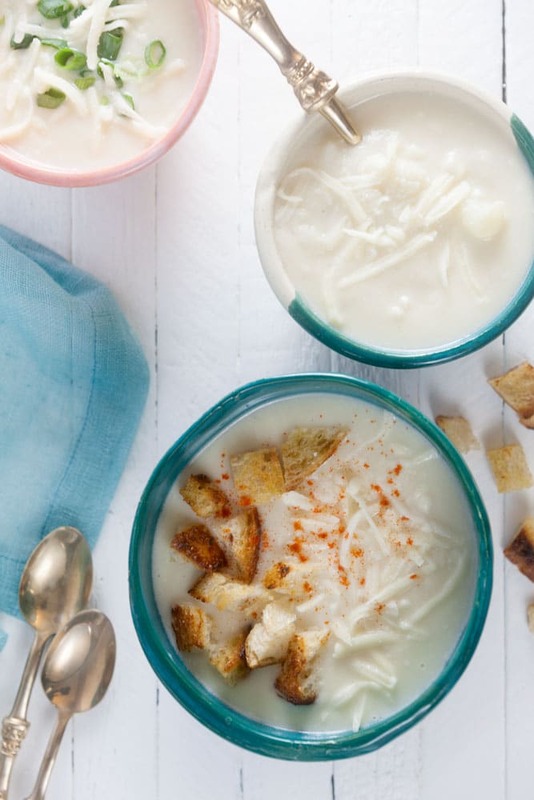 This cauliflower soup is velvety smooth and perfect for sipping out of a mug, but it’s also a great blank canvass for all sorts of fun textural toppings. Leave some of the cauliflower florets behind when you blend the soup to add chunky pieces, top your bowl with bacon and scallions, or enjoy it my favorite way – topped with toasty croutons and smoked paprika. Whatever you do, don’t forget a little extra cheese for the top of your bowl! It’s gets melty and stretchy and oh so delicious. Heat the oil in a medium saucepan set over medium-high heat. Add the celery and onion and cook 5-7 minutes, or until soft. Add the cauliflower and stock. Bring to a boil, then reduce heat and simmer 10 minutes, or until the cauliflower is soft. Transfer to a blender; blend on high until smooth. Return the soup to the pot. Slowly stir in the mozzarella until melted. Add salt to taste. Serve the soup topped with croutons, smoked paprika, and additional mozzarella shreds. To make a version of this soup, use vegetable broth instead of chicken stock. 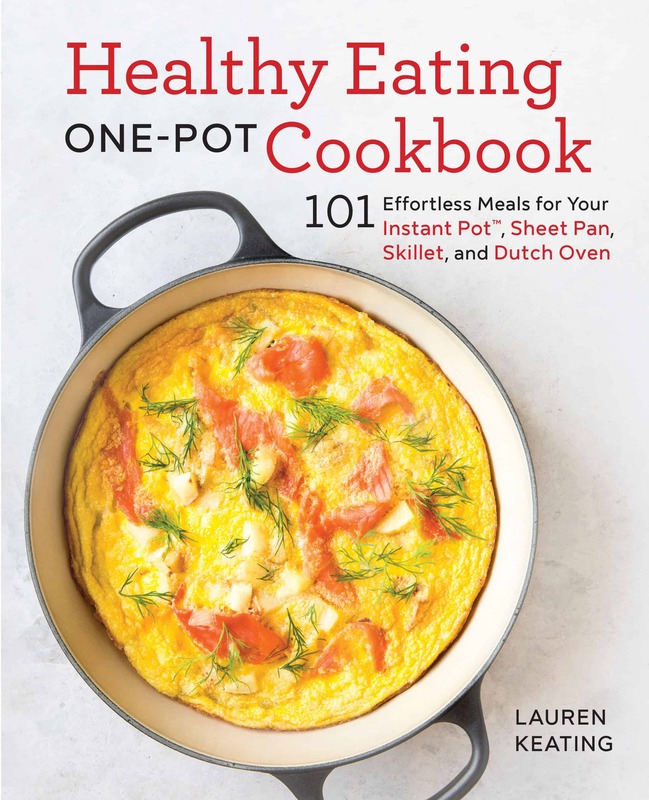 For best results, look for a broth that doesn't contain tomatoes.